Ever longed for the possibility of using two different WhatsApp accounts on your phone, or inside other social networking apps that don’t let you use two accounts? Of course you have, and Samsung has been offering a way to do that via Secure Folder, a feature you find on the company’s flagships and now, on most of its handsets running Android 7.0 Nougat. Secure Folder creates a dedicated environment that’s sandboxed from the regular data on the phone, which means you can install WhatsApp, Facebook, and other apps inside Secure Folder and log into a different account. With the new Galaxy J (2017) handsets, Samsung is removing Secure Folder from the equation and offering a direct way to use separate accounts on social networking apps. The Galaxy J (2017) devices come with a feature called Dual Messenger, and it does exactly what the name suggests. Dual Messenger works by installing a separate copy of the app on the device; you see two shortcuts for the same app in the app drawer, so you can fire up each instance of the app, log in to different accounts, and, well, use them just like you would use two different apps. 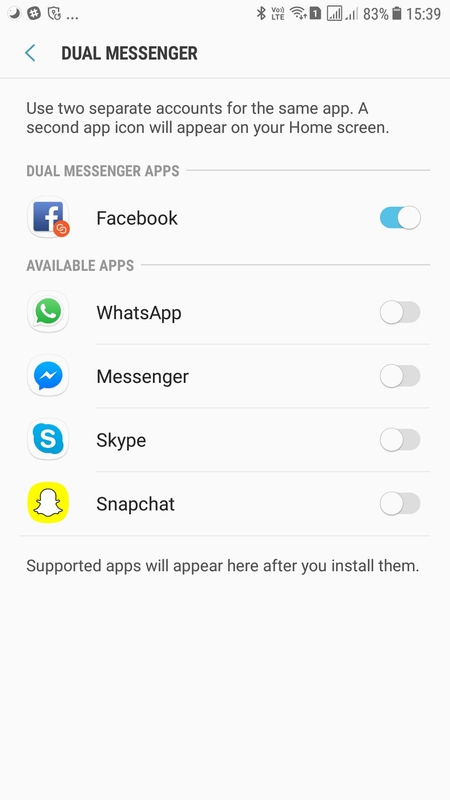 Dual Messenger supports apps like WhatsApp, Facebook, Facebook Messenger, Skype, and Snapchat; I only had the aforementioned apps installed on my phone, so you might see more apps with Dual Messenger support on your device depending on the ones you have installed. Naturally, apps that officially support using more than one account don’t show up in Dual Messenger, such as Instagram. 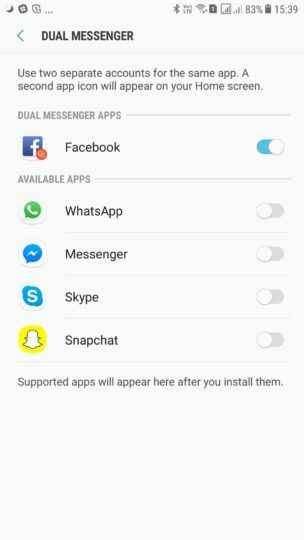 If you have one of the Galaxy J7 (2017) smartphones (including the India-exclusive Galaxy J7 Max), you can find Dual Messenger in the Settings » Advanced features menu, where enabling the feature for each app can be done with a single app. Once enabled, you will see two icons for the app in the app drawer, with a small icon of a linked chain indicating which of the two is the second app. 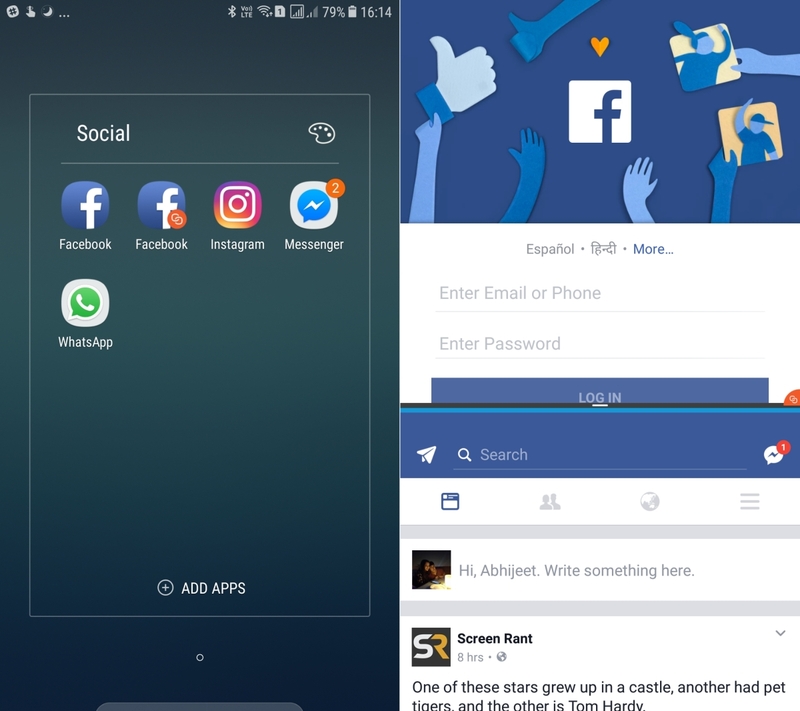 Since the phone treats the two instances as individual apps, you can even use them at the same time in Multi Window mode. It’s unclear how Dual Messenger works, and if it’s simply an extension of Secure Folder, it would be great to see Samsung bringing support for a few regular apps in addition to social networking apps. Hopefully, Dual Messenger will show up on other Galaxy devices as well, although it’s possible Samsung will keep it exclusive to its budget smartphones. Hi guys! I need some help.I am new in this site.My dual messenger apps like dual Facebook,dual Facebook messenger is not opening and I can’t use that from now.My son uninstalled snapchat and the dual Facebook messenger and later I installed snapchat again but Only one snapchat is showing and Facebook and Facebook messenger isn’t working at all.skype and whatsapp are working good but this 3 app aren’t working.Any suggestions please how I can make them working. But I do not know where in dual messenger is the message database and media of the cloned whatsapp are store on the phone? Does anyone know? Exactly what we mention in the article. 😉 Dual Messenger works better because you don’t need to go into Secure Folder, which can take some time to load. Will the Note 8 have this? I would like this for games 🙂 Using secure folder increase battery drain because it needs google play services to function properly.